We’ll send a plumber to your home or business that you can trust. If you have been having difficulty locating a reliable and qualified plumber in the Mt. Pleasant, North Carolina area, your search is over when you call us at Hall’s Plumbing. 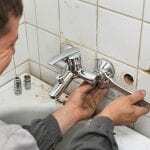 Complete satisfaction with our service and the plumber we send to your home is 100% guaranteed. One of the complaints most people have when they call a plumber is that they don’t arrive on time for appointments. We promise you that won’t be the case when you call us. We are on time, every time. We are so committed to this that if we’re not on time, we pay you $5 for each minute we are late, up to $300 towards your service call. Our highly-skilled, expertly-trained plumbers are ready to handle all your plumbing needs, including water heater repair or replacement, well pump repair and installation, shower and tub repair, water softening and conditioning equipment and service, finding and repairing water leaks, gas line installation and repair, toilet repair, faucet and sink repair, drain cleaning, video drain inspection, and pipe repair. If you need a plumber for your home or your business, give us a call, and we’ll get the job done right for you. If you have any questions about what a plumber from Hall’s Plumbing can do for you, or you are ready to schedule an appointment, don’t hesitate to contact us. At Hall’s Plumbing, our plumbers proudly serve Statesville, Iredell County, Kannapolis, Mooresville, Conover, Newton, Maiden, Mt. Pleasant, Taylorsville, Davidson, Sherrills Ford, Denver, and Terrell, North Carolina.